Please send an inquiry before booking online. This modern retreat from everyday life is a front row seat to all the action you can handle! 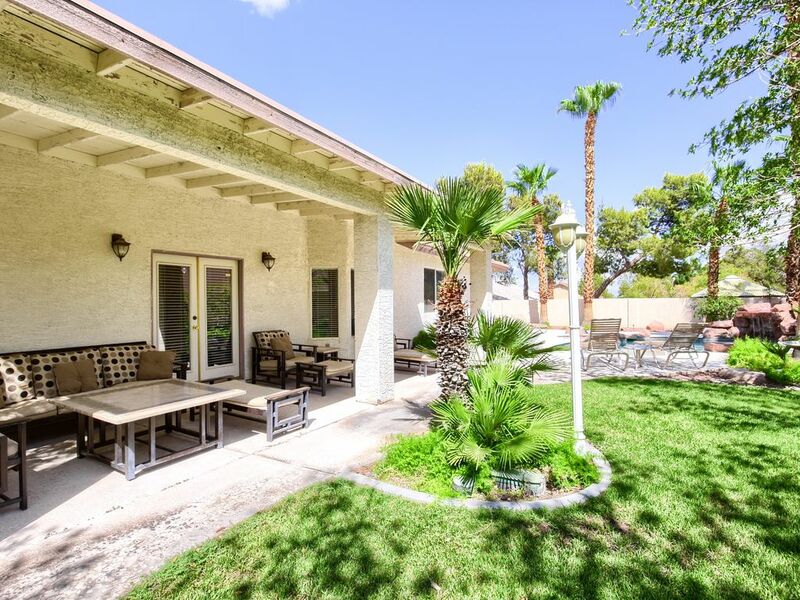 Just 5.8 miles to the strip, and 10 minutes from Red Rock Casino and Resort. Other nearby ammenities are Boca Park Shopping Plaza and restaurants, Red Rock National Park, and top rated golf courses. 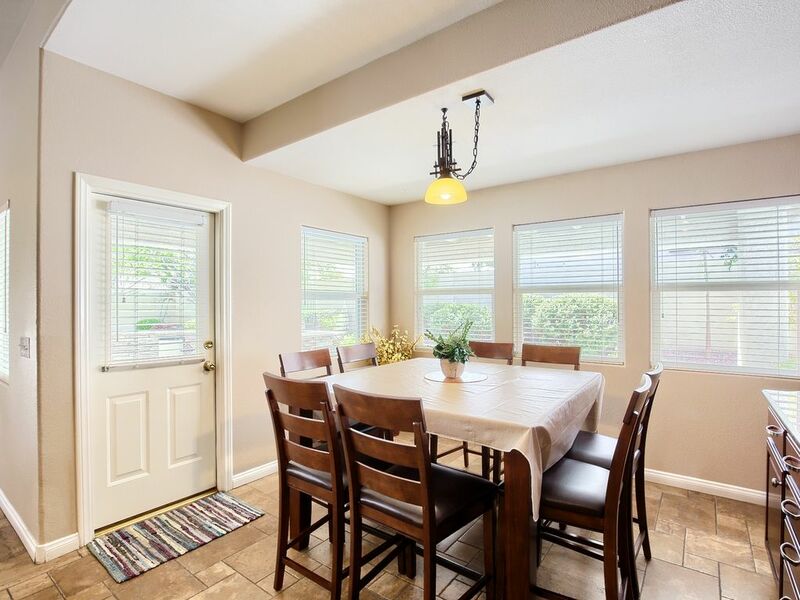 This home has been completely remodeled and professionally decorated with the sole purpose of vacation rental and has never been lived in. 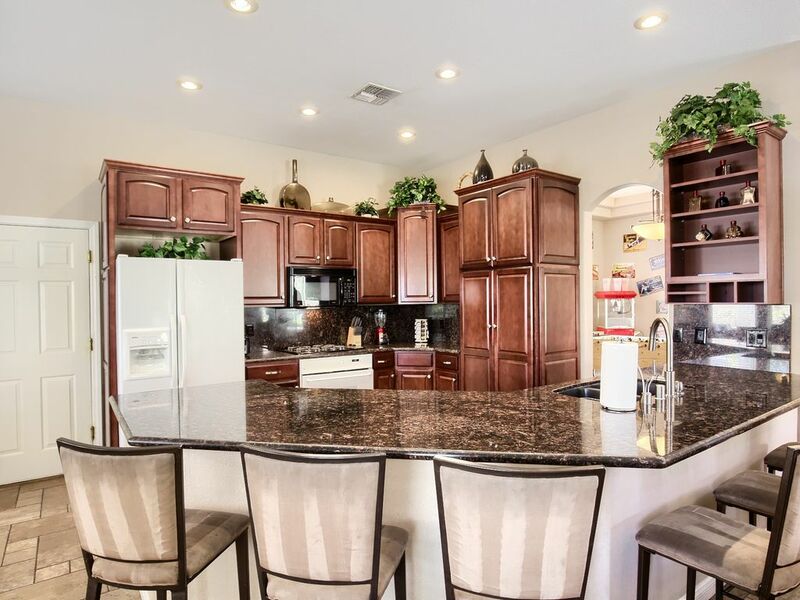 It features over $150,000 in furnishings alone! It is certified hypoallergenic. No Mold, No Pet Dander, and No Smoke. I even run an industrial ionizer in between guests, shock the pool, and go through a specific cleaning process. It is clean, clean, clean! 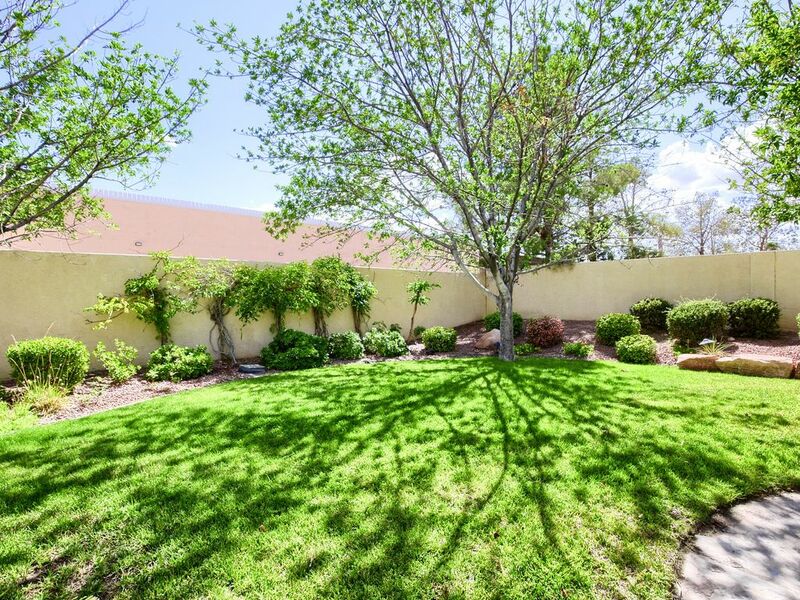 It is located in a custom home neighborhood on a cul-de-sac street. As always when renting a home for your vacation, location is key. 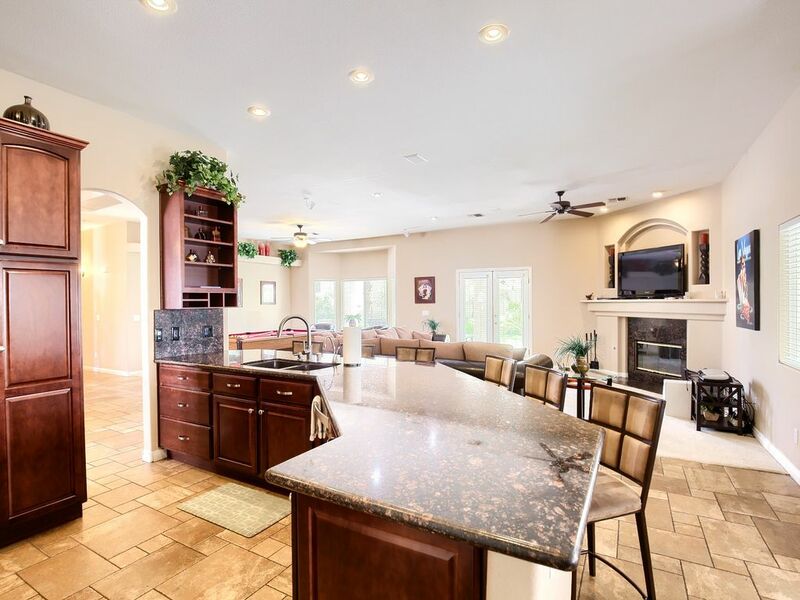 close to 3,000 sq ft single story custom home on over 1/3 of an acre. 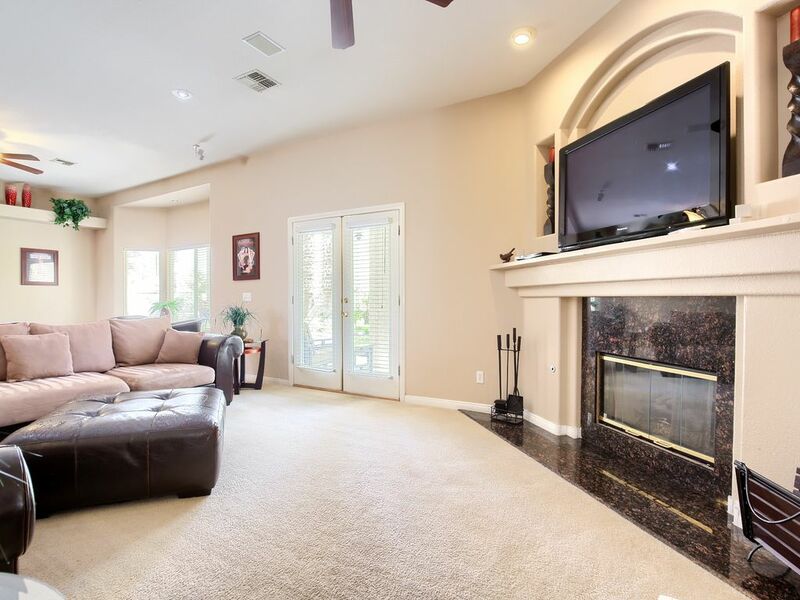 The moment you walk through the front doors, you're greeted by a luxurious open floor plan starting with the living room/great room that is an entertainment paradise. 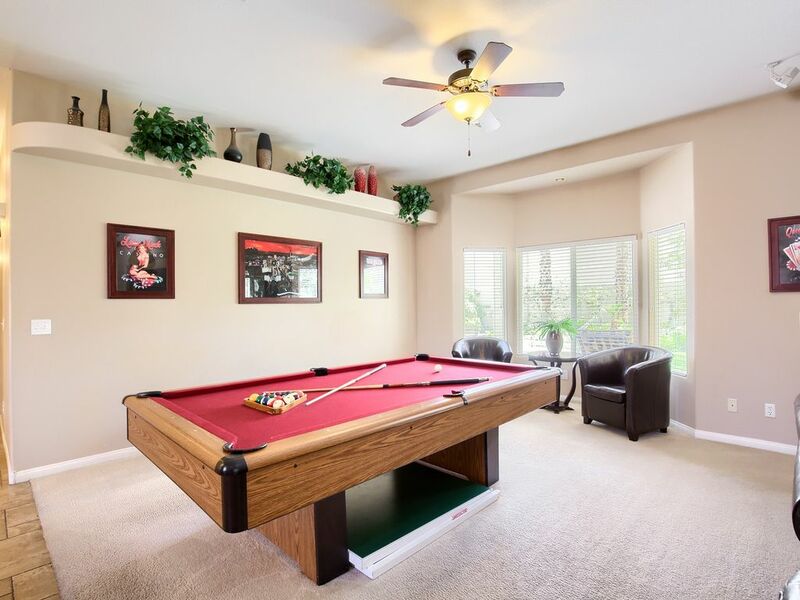 The regulation 8 foot pool table was professionally installed and leveled with a table tennis and air hockey setup. 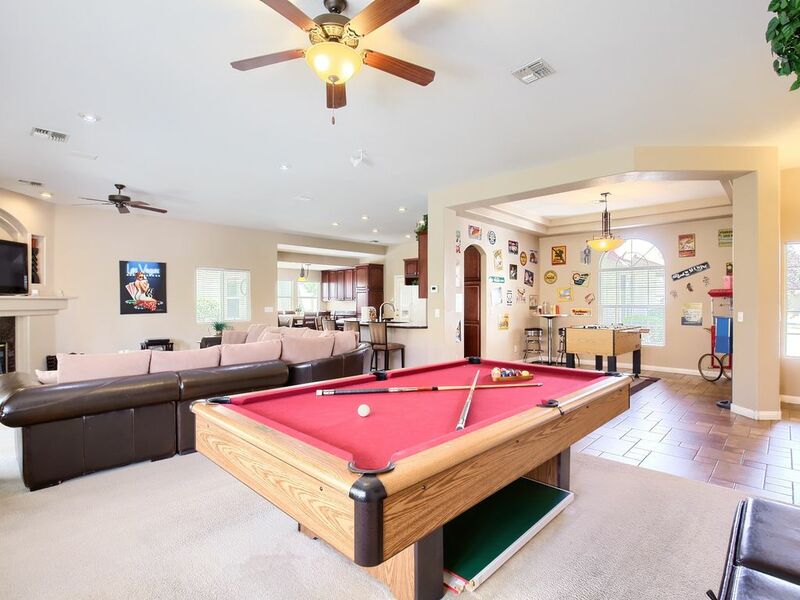 Set back into the bay window are two leather lounges, and additional seating for multiple players. The walls feature original canvas artwork signed by Ralph Burch. 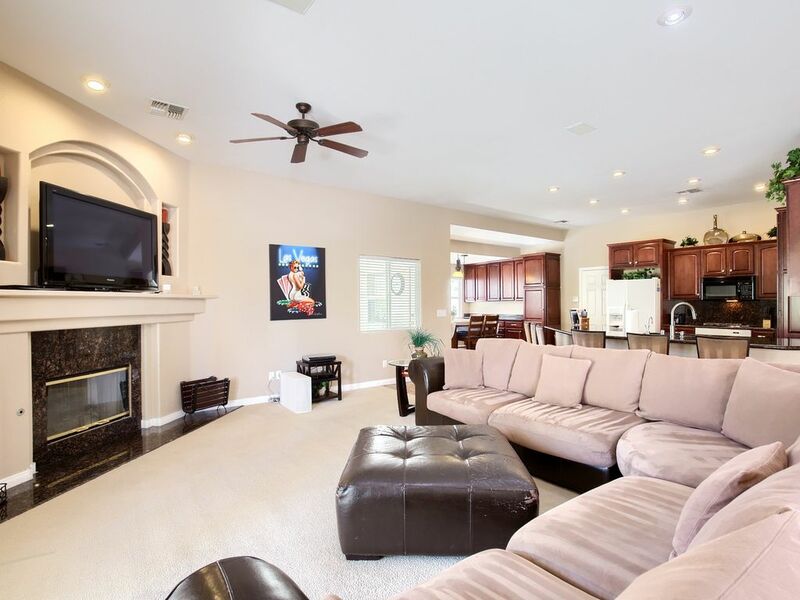 With the beautiful open floor plan, you’re able to enjoy everything the living room has to offer as well. 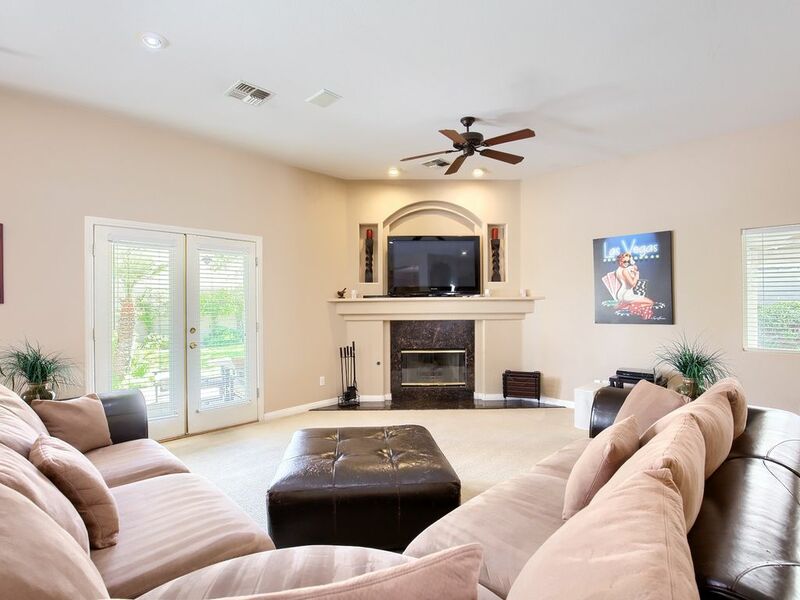 Look over to the living room area and the main feature is the 52' 1080p, HD, Plasma TV that has been professionally color calibrated. 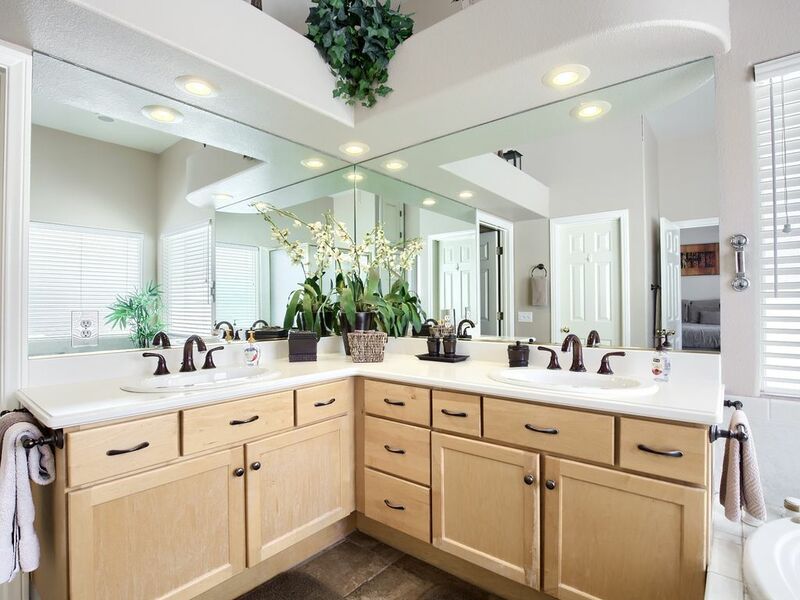 Simply stated, the very best picture and color you can achieve on the market today. 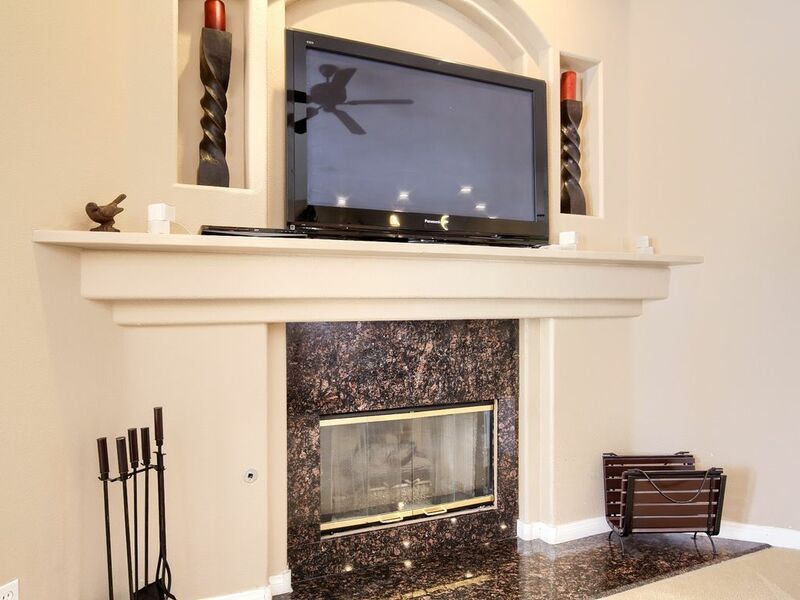 It’s professionally installed over the fireplace which comes in handy for those few chilly nights here in Vegas. The system also incorporates a Bose Lifestyle 5.1 HD, Surround Sound and Stereo system mounted in the ceiling. A six piece custom leather and alcantara micro fiber sectional allows you to enjoy all the entertainment in a way that gives new meaning to the words luxury and comfort. 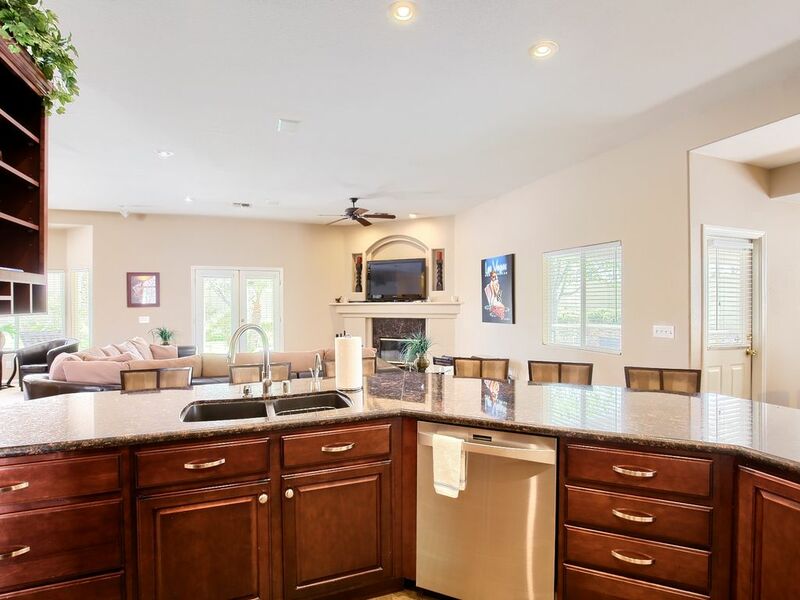 Next, you walk into the open and fully stocked gourmet kitchen and dinette area. It took almost 3 full slabs of granite to cover all kitchen surfaces with back splashes rising to the custom cherry colored maple cabinets. The cook will love the gas top range and electric oven. 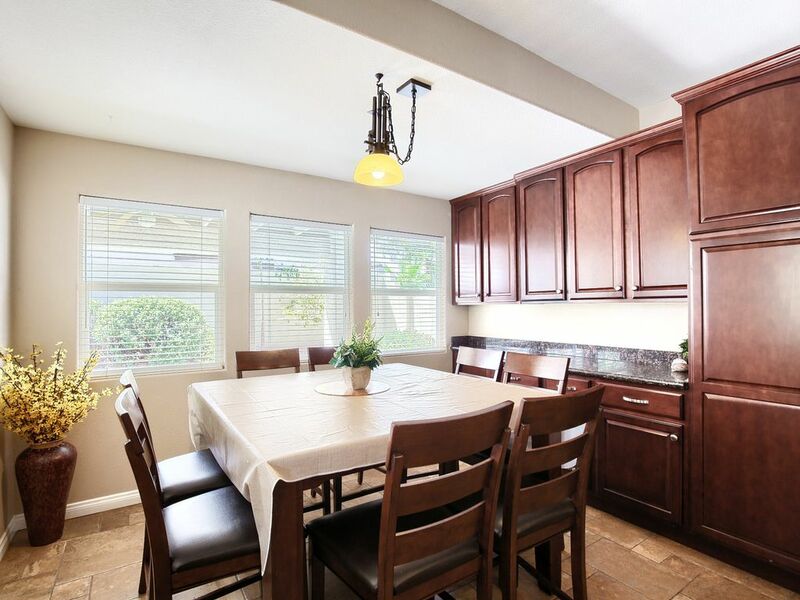 Over sized refrigerator with ice maker and dishwasher included. 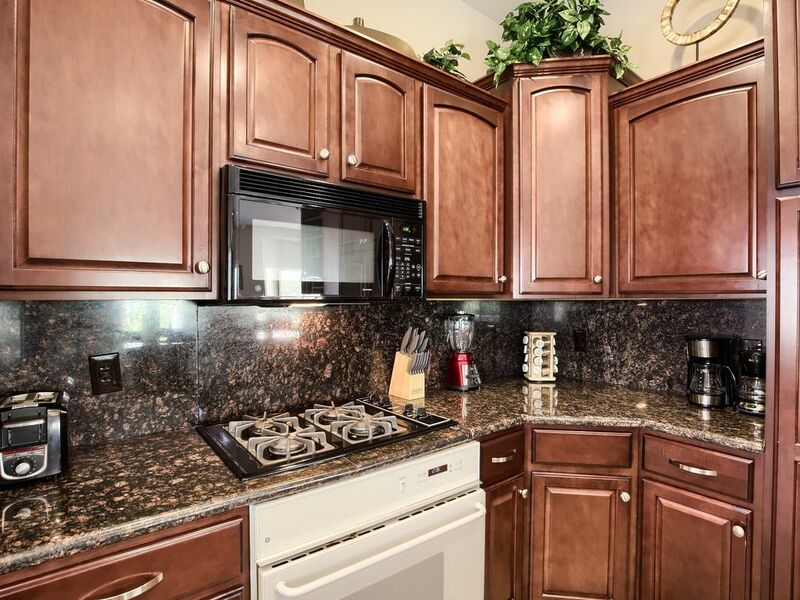 The kitchen comes completely furnished with cookware, serve ware, appliances, etc. Just bring your food! multiple grocery stores within a mile. 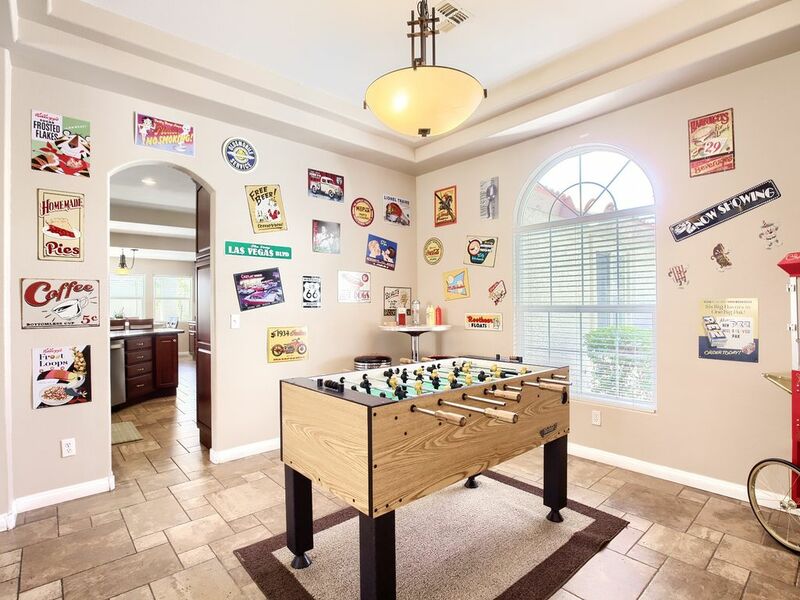 The formal dining room, next to the kitchen and across from the pool table, has been converted into a retro themed game room. There is a regulation foosball table professionally set up and leveled. All the artwork playfully hung on the walls are made of tin and represent the earliest of advertising and media from decades before. These will surely inspire memories to share with the whole family. To add to the theme, there is an original label Coca Cola bar table and matching logo stools. The room was finished off with candy machines and a fully functional Nostalgic Popcorn machine that makes fresh buttery popcorn! At the beginning of the hall to the bedrooms there is a half bath for guests of the main entertainment areas of the house. The Master retreat was designed with an East meets West contemporary Asian inspired décor. Its luxurious and tranquil result contradicts its simple design. The bedding consists of 600 thread count sheets. Opening the over sized armoire reveals a 32' cable TV/DVD player to unwind and relax before bedtime. 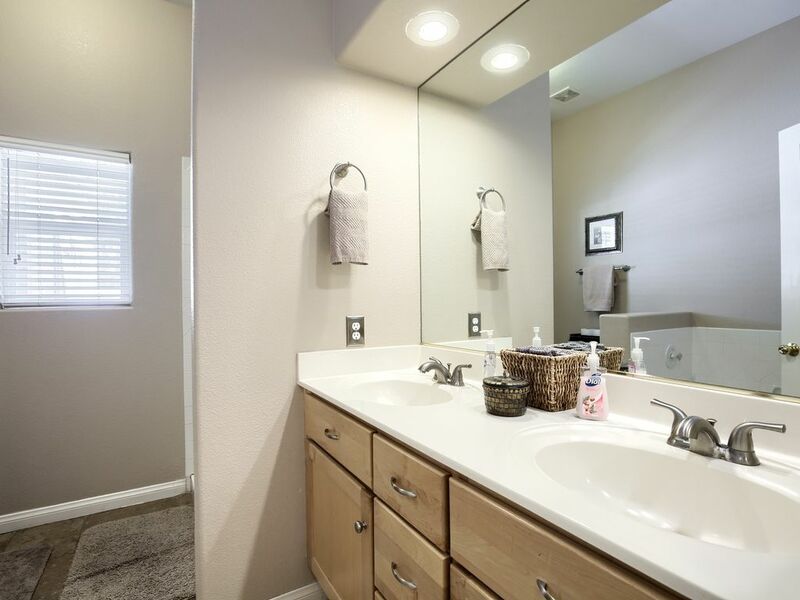 The Master Bath has his and her sinks, Jacuzzi tub, separate shower, private commode, and large walk in closet. Finally, there is your own private entrance to the backyard which we will find our way to a little later. 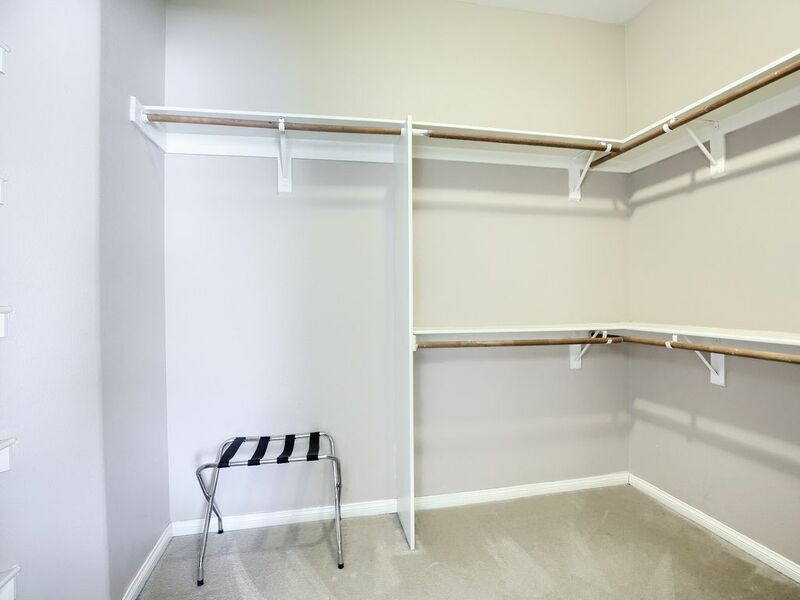 Down the hallway there are two closets with more than adequate storage space, another full bath with his and her sinks and separate shower and tub, a laundry room with full size washer and dryer, iron and ironing board. 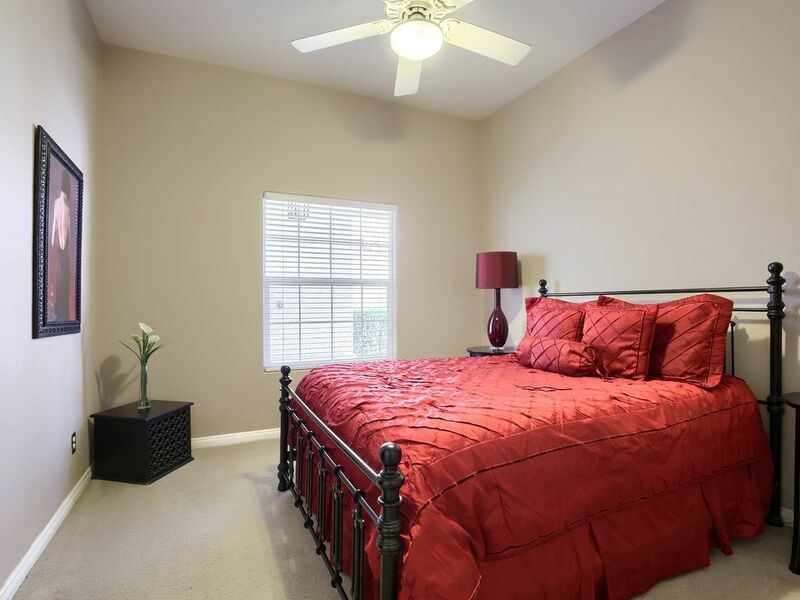 The second bedroom that has been dubbed “The Red Room”, is a Queen Suite with 600 thread count linens and comforter. It contains a dark cherry wood dresser with matching nightstands accented with designer red lamps and artwork in deep, rich, red colors. 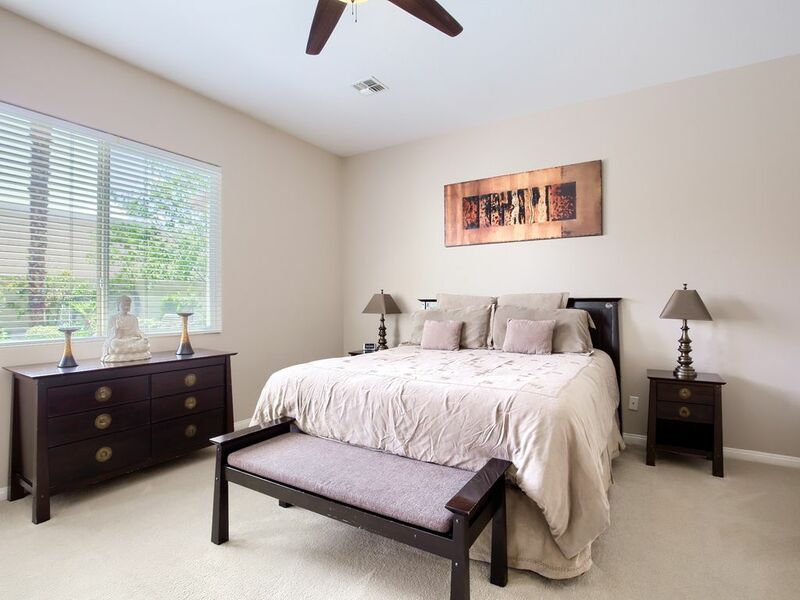 The third bedroom is set up with two full beds in neutral colors and accented with shimmering hues of green and brown. Linens are 400 thread count. It has a large dresser, a nightstand, a suit case rack, and full width closet with mirrored doors. 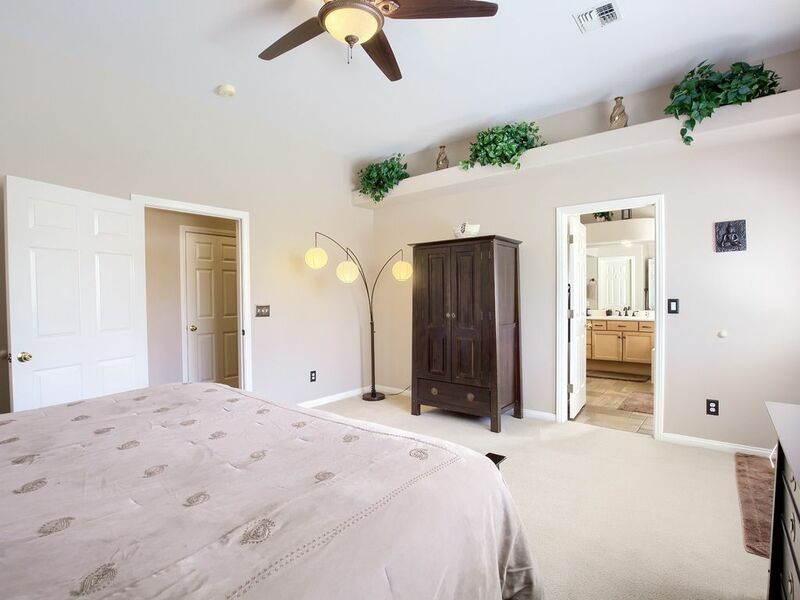 The fourth bedroom is set up as a second Master Suite with neutral tones and marble accents. 600 thread count linens. It has a California King Bed, two night stands, tall dresser, chaise lounge chair, and a walk in closet. 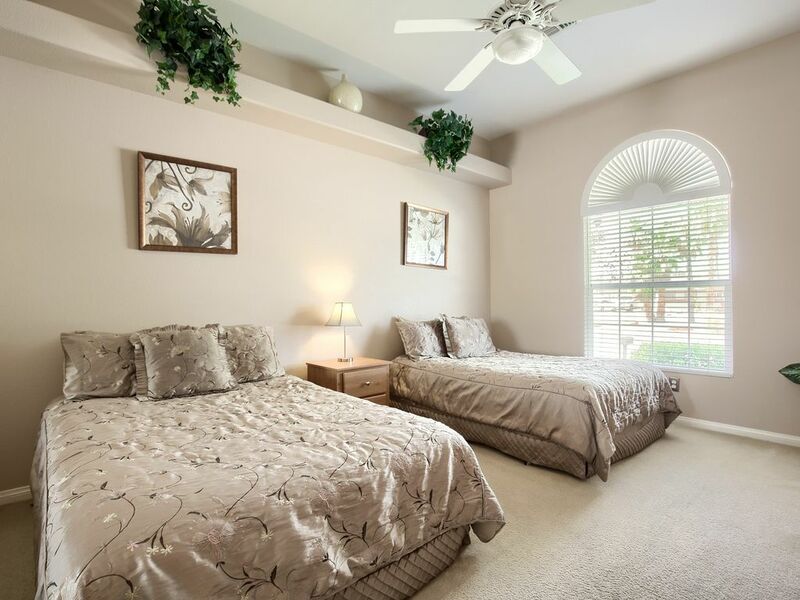 All bedrooms have Cable TV/DVD players. There are three doors from the house that lead to the over sized backyard. One from the Master Bedroom, one from the kitchen area, and two French Doors from the living room. Step out from the living room to a covered patio and $10,000 of the most beautiful patio furniture you’ve ever seen. Almost too nice for outside! 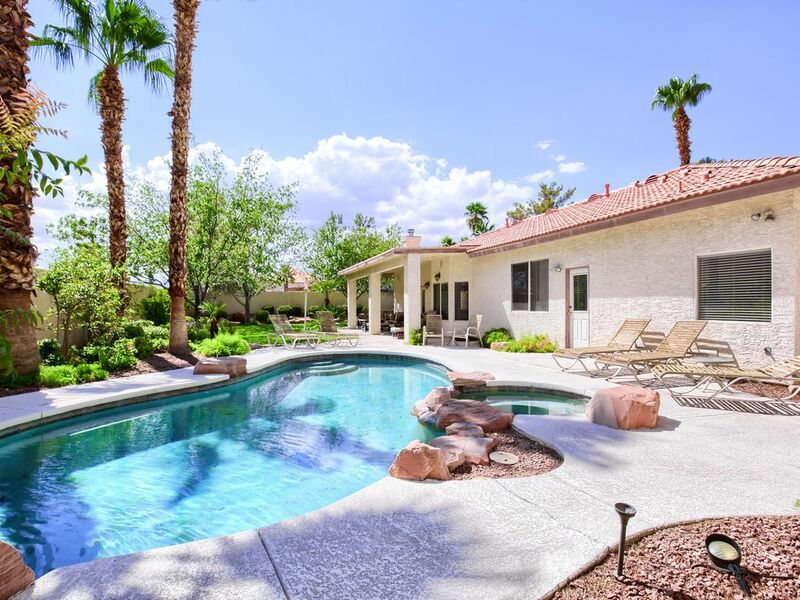 Sit back, relax and enjoy the views of the large grass area, mature trees, palms, and a spectacular pool with a beautiful rock waterfall and attached spa! There are six reclining pool lounge chairs and two small end tables for pool side tanning. 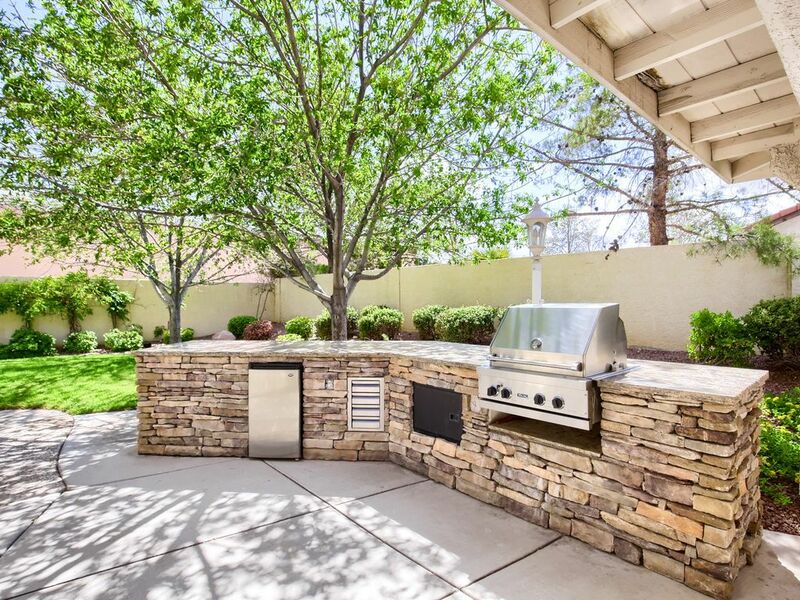 Just when you think it ends, the backyard curves around the patio to a beautiful rock surround, granite covered, gas BBQ island with fridge that is naturally shaded by trees for a comfortable out door dining experience. 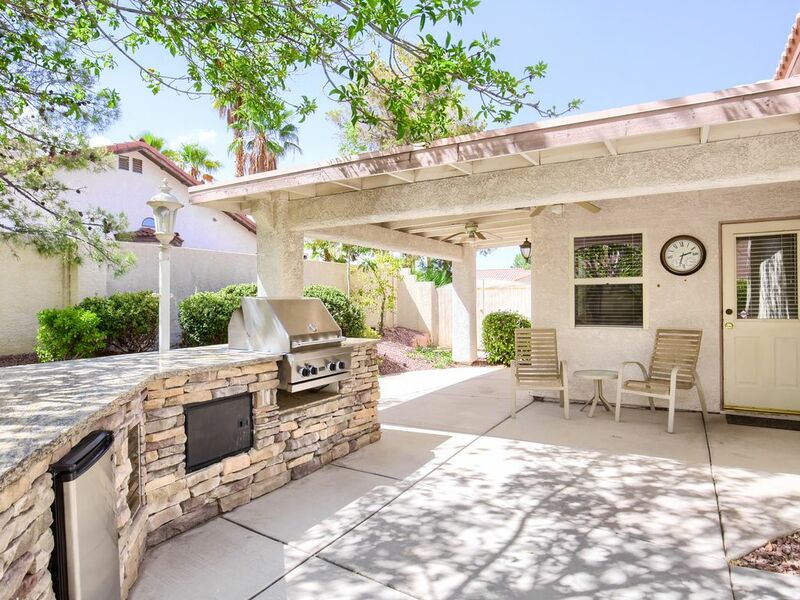 This whole area also features a covered patio and is accessible from the kitchen. The backyard is spectacular. 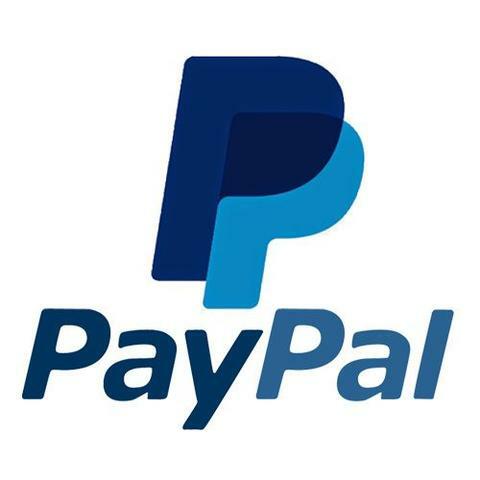 We provide wireless Wi-Fi, and free long distance throughout the continental US and Canada. Maid service is available for extra charge during your stay. We will do everything we can to make your stay as enjoyable as possible. 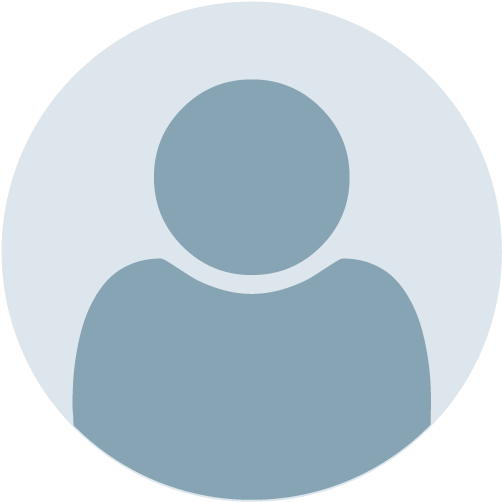 I am the owner, and I personally manage and maintain the property. If there’s anything you need we are just a phone call away. Rates may change for special events or holidays. 2016 EDC RATES ARE $1000 PER NIGHT. Stay with me for a week and I only charge a six night stay. So you get a day FREE! Monthly stay is only $6500! This was the perfect spot for our team's work trip to Vegas. 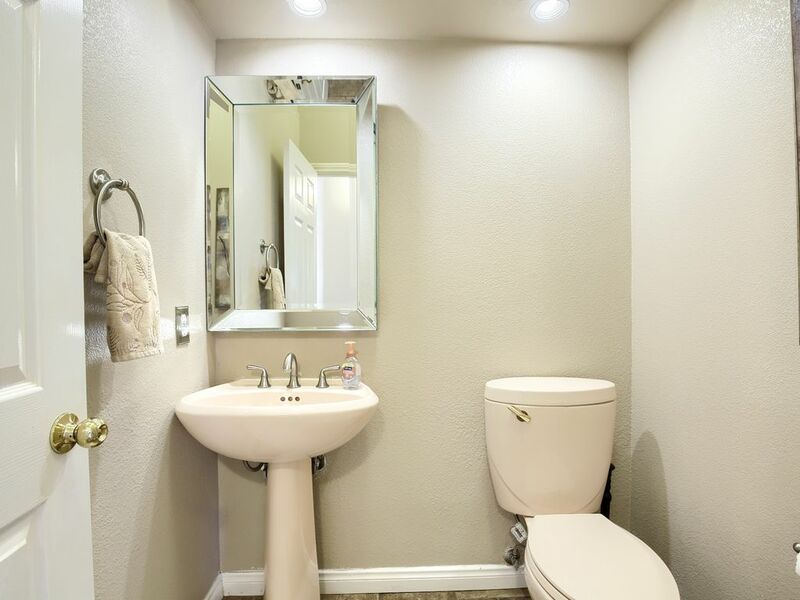 Nice, clean, has all the amenities, and fairly close to the Strip. Couldn't have asked for something better. Thank you Joe! Over and above what you expect. House has everything you need and then some. Outside is beautiful and so much space and seating for hosting or lounging. If we go back to visit family, we would definitely would rent again. 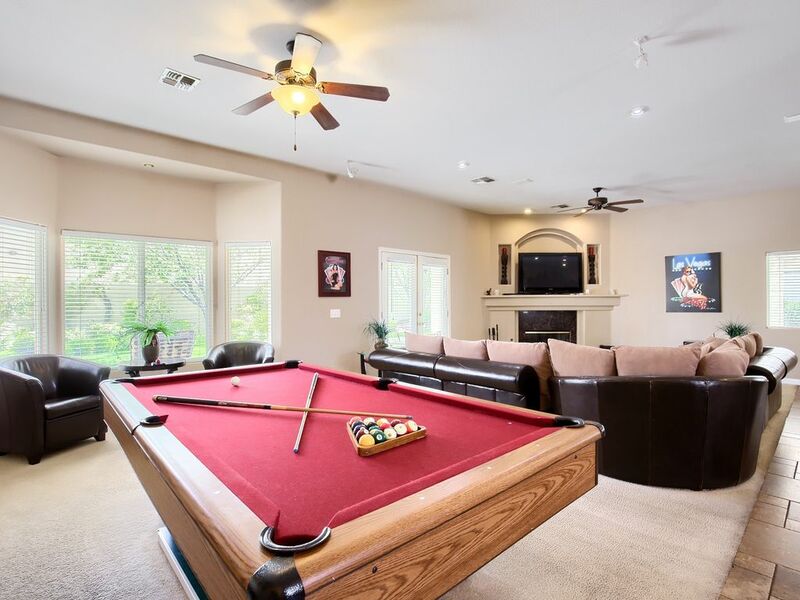 This property was amazing and perfect for three of our basketball families. The pictures do not do this house justice. Beautiful house with plenty of room for all. The pool table, pool and foosball table kept the girls entertained. The furniture was very comfortable. House was super clean and fully stocked with everything we needed. Joe, the owner, was an awesome host. He made sure we had everything and is very knowledgeable of the area. He is super easy to work with and truly cares about his guests. All three families will definitely be back. Thank you Joe for an awesome comfy experience. This property and Joe were great! The house was huge and so clean. Joe helped us in so many ways and was there when we had questions about the pool. I would definitely stay here for my next visit! I stayed with a group of 12 and everyone absolutely loved it!! The owner of the house is a great guy & super chill! He made everything so easy for us to find and gave great hospitality! Definitely recommend him and his home for anyone who is staying down in Vegas! All the conviences of home . Couldn’t ask for anything more . I would stay here again . We had an amazing time! Really appreciate you. I will be sure to recommend everyone to rent with you. 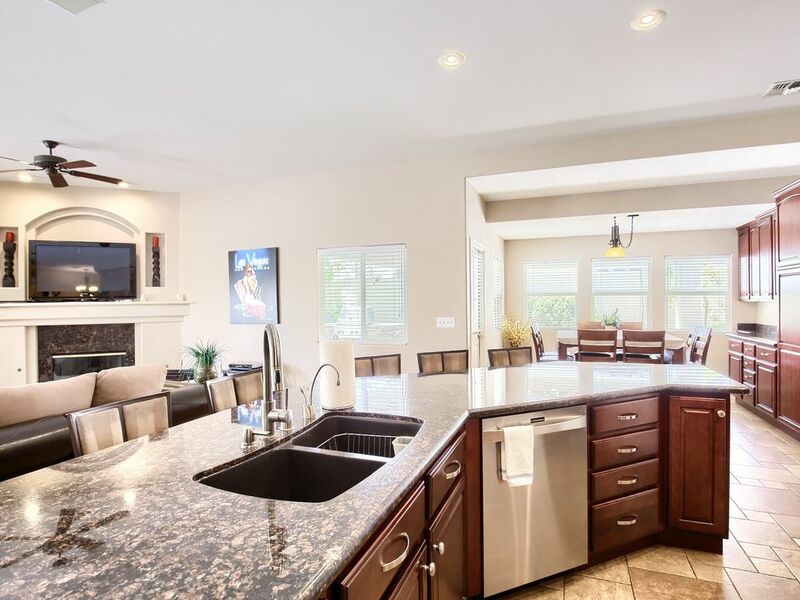 What a clean, private and fun house to stay in and what a great host! Highly recommend!! This was our second stay at this home. Joe is amazing to work with which makes the experience all that much better. 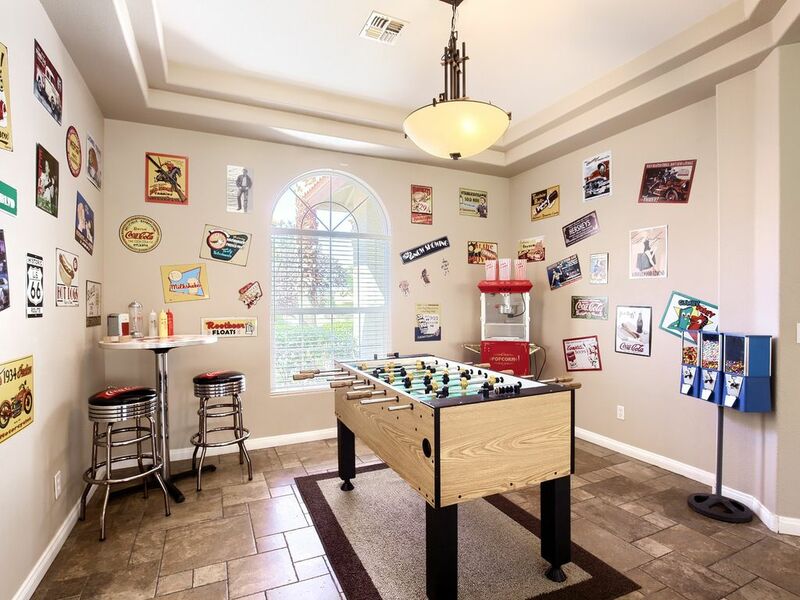 It's a perfect stay for an extended family with kids. 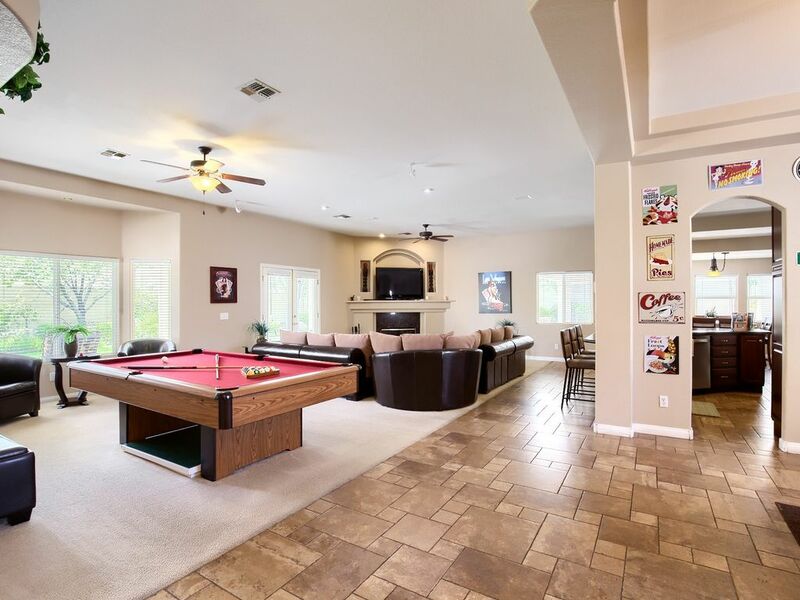 We absolutely love the pool and bbq area! The location is so perfect! Literally minutes within the strip for sight-seeing, close for additional shopping and quietly nestled away on a safe low traffic area. We are looking forward to our next stay! Thanks Joe!!! We came to Vegas to celebrate my bfs 30th bday with a group of friends and the house was perfect. 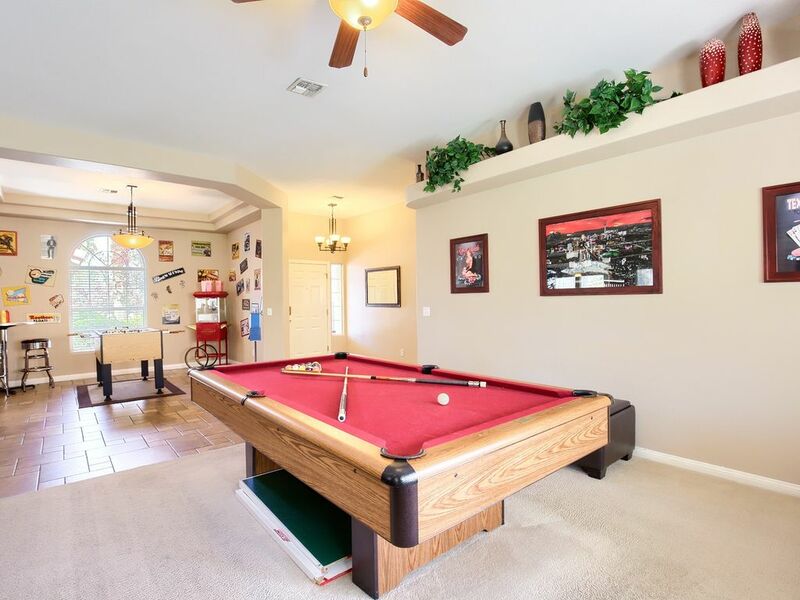 Close to the strip for some fun, but also nice to have the pool and the BBQ area for some down time. Amenities were amazing and Joe was also great. Would definitely recommend and come back. Beautiful large house, clean and above all, good location. Thanks Joe and I'm sure I'll be back !! Joe is a really great host and this property is amazing. I would absolutely stay here again. This is the best house I have stayed at so far and Joe is great with communicating and is accommodating. Thanks Joe, we had a fantastic time in your villa. 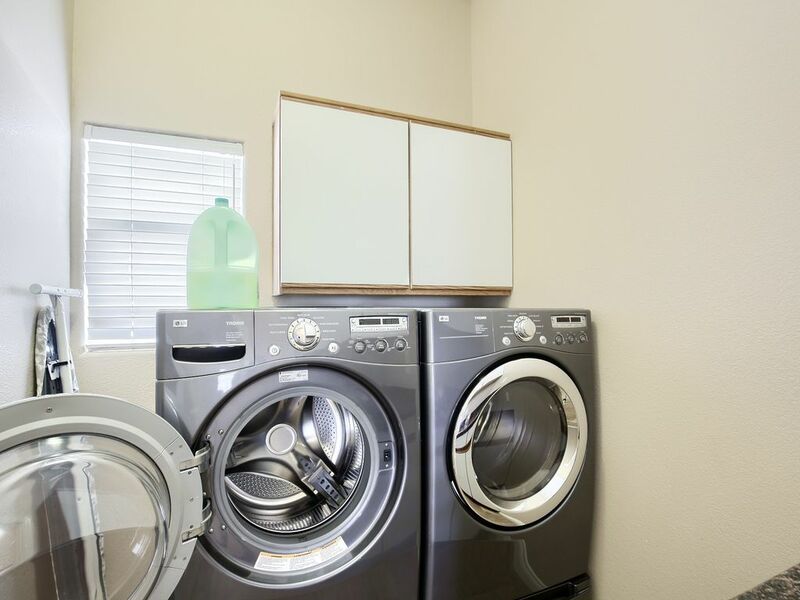 It was very clean and everything that we could have needed during our stay was there. It was great to meet you, and many thanks for the time that you spent running through the property and the recommendations of places to see and eat whilst in Vegas - the Red Rock Buffet was excellent!! Looking forward to returning sometime in the future. This house had everything you could possibly need! The rooms were spacious, that amenities were top notch, the games were awesome. This was without a doubt the best way I have spent time in Vegas. I had a large group and this house provided the perfect way for us to all be together without having to always be together. We relaxed in the pool and the spa, we had private quiet time and when we were ready to come together there was a perfect set up to accommodate! The kitchen was awesome and was stocked with everything you could need so that we didn't have to make any runs to the store. The entertainment was nice and when we wanted to go to the strip, it was a quick 10 minute drive straight down one street to get there. If you want a nice view you can even go out in the front of the house and have a perfect straightaway view of the Stratosphere! The neighborhood was quiet and there isn't anyone next to you or behind you that will be looking over the fence while you enjoy yourself. It really felt like we were all by ourselves there which was extremely nice! The absolute best part of the visit was having the chance to talk to Joe who I think is an amazing owner. He was so thoughtful, communicated well, and went out of his way to make us feel at home. Everyone in my family enjoyed all of the tips and advice he gave. He was as gracious a host as you will ever meet. If you need a place to stay in Vegas, stop looking around!! If this place is available then I suggest you take it. Trust me! You can thank me later!